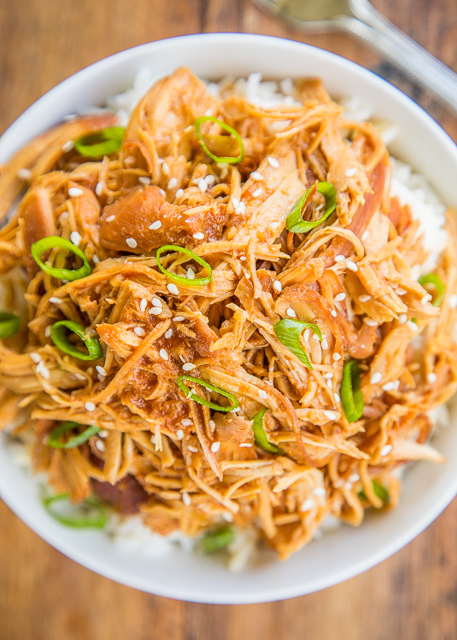 Slow Cooker Huli Huli Chicken - DANGEROUSLY good!!! Chicken breast slow cooked in brown sugar, soy sauce, ketchup, sherry, ginger, and garlic. We ate this twice in one week. It was seriously delicious!! Can use chicken thighs instead of breasts. Serve over rice, potatoes or noodles. Also great on top of a salad! One of our all-time favorite grilled chicken recipes is Grilled Huli Huli Chicken. I decided to take those flavors and turn it into a slow cooker recipe! OMG! This Slow Cook Huli Huli Chicken is crazy delicious! PLUS it is super easy to make. Just dump everything in the slow cooker and let it do all the work. We served the chicken over rice with some green onions. It would also be great over mashed potatoes, grits or noodles. 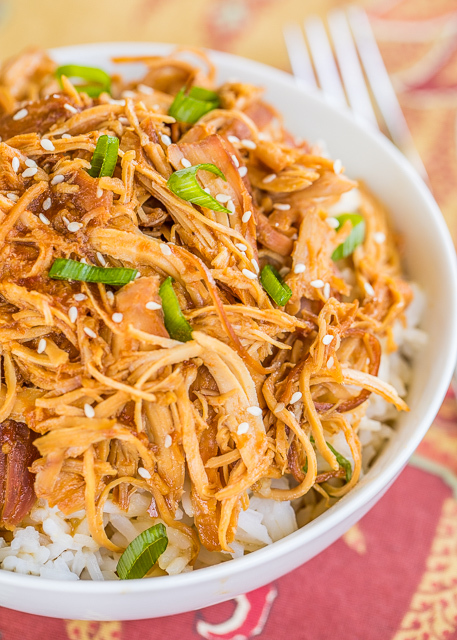 This Slow Cooker Huli Huli Chicken is loaded with amazing flavor! The soy sauce and ginger give the dish an Asian flair. Make sure to pour some of the sauce form the slow cooker on top of the chicken when you serve it. The sauce has all the best flavor! Don't leave it in the slow cooker! Pour it on top and enjoy! 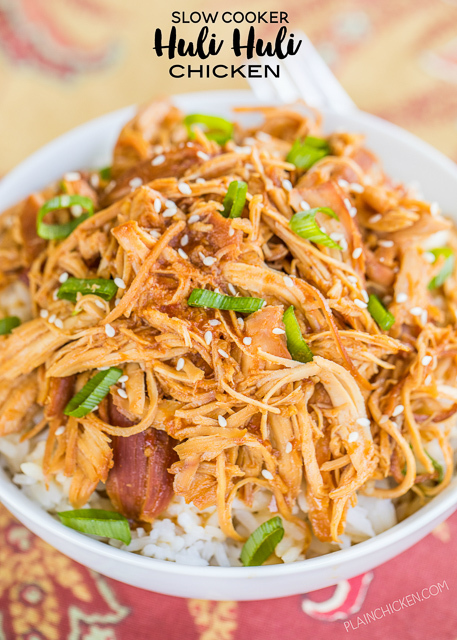 I used chicken breasts in this Slow Cooker Huli Huli Chicken. You could also use chicken thighs if you are a chicken thigh fan. I had chicken breasts in the freezer, so that is what I used. Either cut of chicken will taste amazing. Place chicken in 6-qt slow cooker. Whisk together brown sugar, ketchup, soy sauce, sherry, ginger and garlic. Pour over chicken. Cover and cook on LOW for 6 to 8 hours. Shred chicken and serve over rice, potatoes or noodles. I love your kahlua pork, so I have no doubt I will love this!